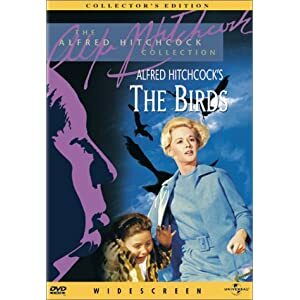 The Birds is one of Alfred Hitchcock's best-known masterpieces. The movie follows the story of a woman named Melanie Daniels, who goes to a small town to begin a romantic relationship. All is well until the town is suddenly attacked by a deadly flock of birds. The people in the town try to stay safe, but some fall victim to the terror from the sky. The Birds stars Tippi Hedren (Melanie Griffith's mom) as Melanie Daniels. Rod Taylor plays Mitch Brenner, the potential boyfriend. This is an excellent scary movie from the early 1960s.